If you are going to provide the excellent solution to your clients, there is a need to update your own technology skills and knowledge about the development but if a team is equipped with all these things but still unable to provide the desired solutions of may be facing problem in the implementation of such solutions then there is a strong need to update the hardware. If you are going to develop an ERP cloud based software solution it will require the specific bandwidth as well as the storage space so the ERP service providers should be well prepared with all tools while providing a solution because if the hardware is not updated according to the technology the developed software will not meet the requirements as well as unable to provide the desired results. In cloud based ERP system the organizations are requiring the services or a software that will be easy to install and easy to access at any time and anywhere. All these things require a high-quality hardware and software that have the capability to meet their expectations. ERP software solution is not a solution or software that needs to be developed once and after its delivery to the client, you are free from all responsibilities but a complete comprehensive software solution with the customer and technical support. While development of an ERP software solution the ERP service provider must be able to provide the reliable services along with the capability of system backup in case of any inconvenience. It is important to provide the online and on time solutions in case of providing the high-quality services to the clients. There should be a complete alternative plan for the clients in case of the failure of one plan and service. There is a strong need to provide the efficient, consistent and quality services to the client. 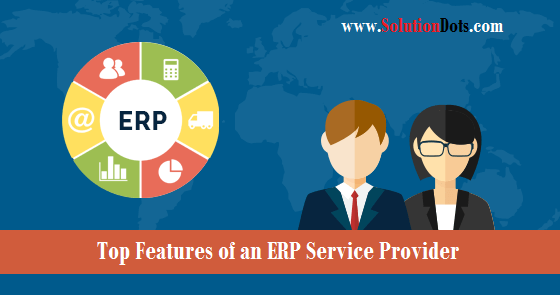 These are the important features that must be possessed by the ERP service provider to gain the attention and trust of the client or an organization. High-quality hardware is important for the improvement and enhancement of the services to the client in the for of software solutions, it will provide the capability to provide the desired results to the client while high-quality services or support is important to gain the trust of client and this trust will improve the market reputation of the software service provider along with their work efficiency.